Transform Your Child Into a Pop Star! Do your children like to rock out to songs played on the radio or CD Player? We are constantly listening to music all day long and constantly singing in our pretend microphones (Hoses, Sticks, etc) or playing pretend piano! Now my son doesn't have to pretend to have a microphone or piano anymore because he has the real thing from KIDZ BOP! I love how my son was instantly transformed into a Pop Star with these great products! They even offer clothes for any child to transform instantly into their favorite Pop Star! Any kid can play like a Pop Star with the KIDZ BOP Glammerati Pop Star product line which brings exciting innovative piece types, classic play patterns, on trend designs, and value price points to include instruments, dress-up, accessories, and make-up. When my son saw his new microphone and keyboard, I don't know if I have ever seen his eyes get so big!!! :) He was so excited to finally have a real microphone and his own keyboard! The product line embraces the excitement and high energy associated with the chart-topping brand with awesome blinging microphones, instruments, fashion accessories, glam kits and more with on-trend styles and color pallets, and fantastic technological features. 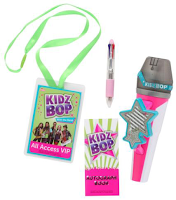 With LumeFX light-up features, VIP All Access Backstage Badges, Concert Tickets, and top Kidz Bop songs built right in to several of the items, kids will want to collect the entire line to get the full Imperial Toy KIDZ BOP Pop Star experience! Kids can jam with glam and play like a real pop star with the Glammerati Pop Star Keyboard. 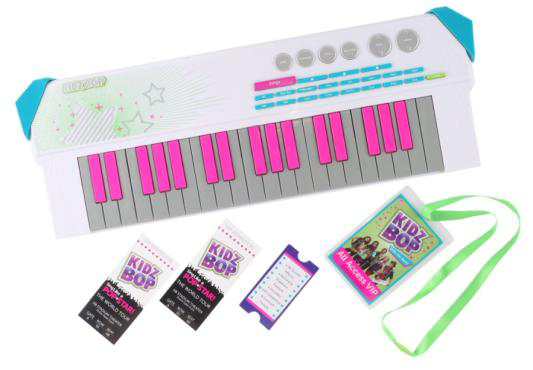 With its on trend color scheme and special glitter effects, the Glammerati Pop Star Keyboard is a full keyboard with 37 real working keys, 4 instrumental sounds, 8 rhythm sounds, 4 special sound effects and features 3 KIDZ BOP hits - "Billionaire", "Break Your Heart", and "Whip My Hair". The record and playback function provides kids hours of superstar fun and can strengthen confidence levels for every performance in their lives! Includes an “All Access VIP Credential,” lanyard, two concert tickets and requires 3 "AA" batteries. The Pop Star Keyboard is available in pink and turquoise. It is appropriate for Ages 5+ and retails at $29.99. Little pop stars will have hours of rockin’ fun as they bling while they sing with the Glammerati LumeFX Megastar Microphone. The Glammerati LumeFX Megastar Microphone includes an amplifier and features 3 KIDZ BOP hit songs - "All the Right Moves", "Hey Soul Sister", and "This City". Every pop star will surely shine as the light up handle sparkles for every magical performance, whether it’s with friends, mom and dad, or just practicing alone in front of the bedroom mirror! The built in crowd cheers provide the true performance effect and boost confidence, while the record and play back feature sets the tone for the making of a superstar! The Megastar Microphone requires 3 "AA" batteries and available in pink and turquoise. It is great for Ages 5+ and retails for $19.99. My son favorite KIDZ Bop product is the Glammerati Sing-Along MP3 Player Microphone with Stand. He loves that it has a stand and five songs that are some of his favorites already! He can truly sing along with his microphone! This sparkly and edgy microphone stand includes an MP3 jack located on the back of the player, a built in speaker, and includes an exclusive 5-Song KIDZ BOP CD featuring "Rolling in the Deep", "The Edge of Glory", "Firework", "Stereo Hearts", and "We Found Love." With the Sing-Along MP3 Player and Microphone with Stand, kids can live out their pop star dreams and sing alone, with friends, or along with the band! Includes an “All Access VIP Credential,” lanyard, two concert tickets and requires 4 "AA" batteries. It is great for Ages 5+ and retails at $39.99. So never use a pretend microphone, keyboard or guitar again in your house! 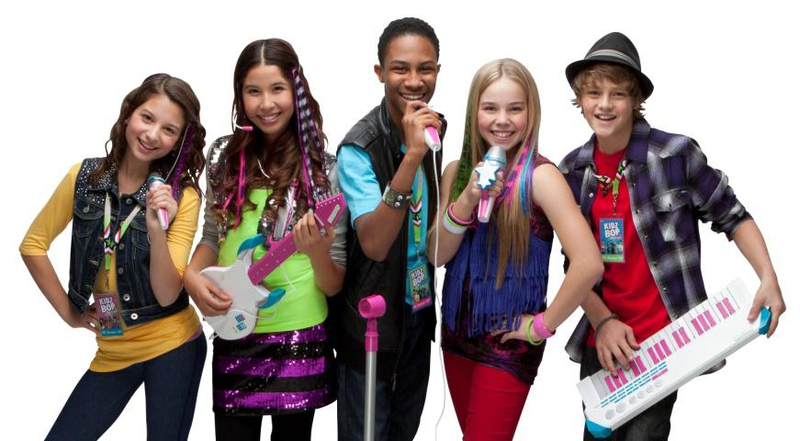 You can have your very own rock band and concert with the KIDZ BOP line of products! Buy It: You can purchase all KIDZ BOP products from a local retailer.